NISA's Tips & Tricks - Touhou Genso Rondo: Bullet Ballet (Part 2) | NIS America, Inc.
Jupy's Touhou Tips for Remilia & Sakuya! Jupy here to show off my two (best) Touhou gals in Touhou Genso Rondo: Bullet Ballet: Remilia and Sakuya! Remilia has been a long-time favorite Touhou character of mine, so I’m excited to be talking about her and Sakuya with everyone! While every Touhou girl in Genso Rondo has her own special set of “final boss” moves, they also each have their strengths and weaknesses. 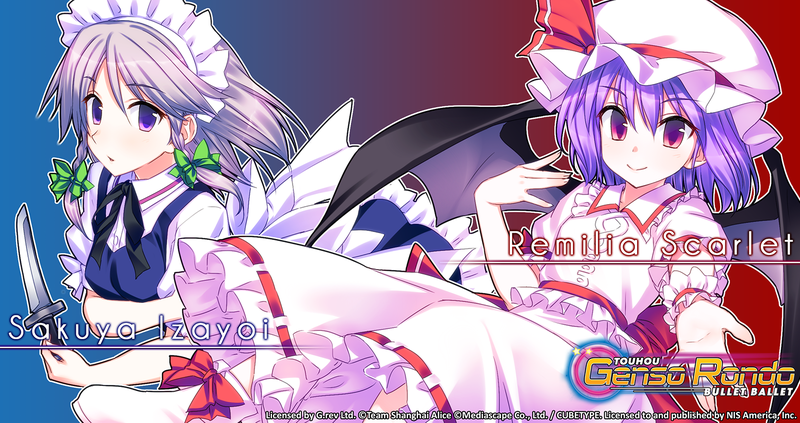 Let’s take a quick look at Remilia and Sakuya! Remilia Scarlet is the owner of the Scarlet Devil Mansion, where many other characters, such as Patchouli Knowledge and Flandre Scarlet (Remilia’s younger sister), live. As a vampire, Remilia cannot expose herself to sunlight and thus resides in the shadows of her mansion, and despite her child-like appearance, she boasts an incredibly strong arsenal of abilities that can render her enemies helpless. As she is able to move faster than the speed of light, shapeshift into a bat and summon lesser devils, Remilia is a formidable adversary! A basic attack that protects Remilia as much as it damages her opponent. The energy spheres that emit from her body are able to follow her opponent and deal damage even if Remilia is far away. This is a perfect move that allows you to move in close to your opponent and shower them with a hurricane of bullets that circle around Remilia like a force field. As your force field lowers your opponent’s HP, you can dive in for a melee attack, and as the force field dissipates, it blooms into a floral display of deadly bullets that hit your opponent! Remilia’s Charge Attack forms a single bright crimson arrow that pierces her enemies. This attack is pretty powerful, and that could be a reason why it uses up the energy from your Charge Gauge. After your Charge Gauge is depleted, you will be unable to use this attack (and also be unable to use your Spell Card!) so use it wisely! Remilia’s strong arsenal of bullet hell moves give her an advantage in the battlefield when dealing damage up close. However, her long-range attacks can be messy, as her bullets tend to randomly disperse outwards towards the tail end of her close-range attacks, creating easy blind spots and ample time for the opponent to dodge her attacks at a distance. Sakuya Izayoi is the Head Maid to Remilia in the Scarlet Devil Mansion. As she is in charge of overseeing the other maids who end up not doing any work, Sakuya uses her ability to manipulate time and get all of the work done. With this ability at her disposal, she is also able to seemingly conjure silver knives out of nowhere and use them as weapons. Despite being “human” and no older than twenty, Remilia has noted Sakuya’s extremely long history as a maid in the Scarlet Devil Mansion. By summoning flaming shurikens, Sakuya can then dash across the battlefield and, if she so wishes, perform bullet or melee attacks while her opponent attempts to evade the shurikens that ricochet off the boundaries and have another chance at hitting them. What’s more awesome than bullets that have two chances to hit your opponent? Those that have homing capabilities and still have those advantages! Like the SM attack, these projectiles ricochet off the battlefield boundaries in the event they miss their target the first time around. An added advantage is that the shurikens summoned here give Sakuya about two seconds to dash and attack her opponent from a different location altogether. Two attacks from different directions… Can you dodge both? This is perhaps one of her strongest (and most deadly) attacks while on the field. The knives she throws in a floral pattern gives her opponent little room to dodge, and the fiery shurikens that do not hit her opponent the first time come ricocheting back from the boundaries. In essence, it’s a field of flying daggers wherever you look. Because of her speed, Sakuya is a very strong character to use against opponents that may potentially have scattered or slower bullet moves, as she can dodge them fairly easily. In addition, her battle style gives her a unique advantage while fighting from afar, as her homing bullets can chase them down. Her close-range attacks can only come in short spurts, however, as she can only deal heavy damage during her melee attacks before she must retreat to safety. So there you have it! I hope everyone loves Remilia and Sakuya as much as I do. This game comes out on September 6 in North America and September 9 in Europe, so preorder it on the NISA Online Store, Amazon or GameStop today!